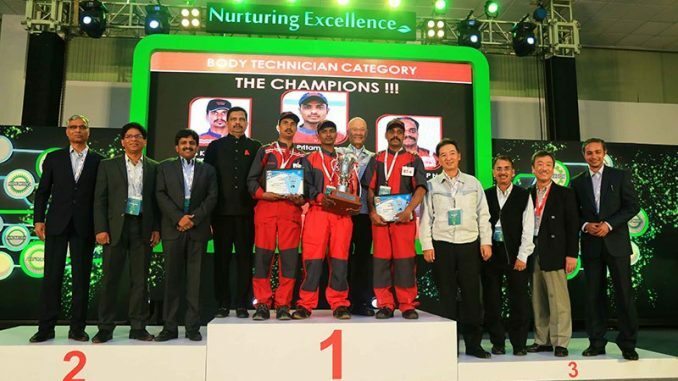 Bangalore: Toyota Kirloskar Motor (TKM) chaired a valedictory function organised to mark the culmination of ‘Toyota Tantrajna’, a unique skill development project initiated in association with the Automotive Skills Development Council (ASDC). Instituted in continuation to the automaker’s commitment to enhance the quality in skill development imparted to the youth in India, the programme aims to increase employment opportunities in the automotive sector for underprivileged youth from both rural and urban, between the age group of 18-25 years. The event held at the Toyota plant in Bidadi, Karnataka was graced in the presence of senior representatives of Toyota Kirloskar Motor Deputy MD Yoshihiro Horinouchi, Toyota Kirloskar Motor Senior Vice-President Kan Asaine, Toyota Kirloskar Motor Senior Vice-President Raju B Ketkale, and Toyota Kirloskar Motor Vice President Sailesh Shetty. ‘Toyota Tantrajna’ launched in May 2016 comprises of 600 hours of classroom training by globally certified skill trainers, with a holistic approach balancing focus on body, mind and attitude. A comprehensive year and a month plus training module consists of an induction and fundamental skill training, On the job development and class room training and trade knowledge training includes language speaking skills, computer soft skills, interview etiquettes, etc. After completion of course evaluation and certification by ASDC, TKM synergises to connect the trainees with prospective employers through ‘job fair’. Toyota provides an attractive stipend, free commutation and canteen facility for the trainees during the training period. The first batch of Toyota Tantrajna has successfully trained more than 30 trainees, and the company is looking to impart this skill module to 400 youths by 2020-2021. “I would like to congratulate all the participants, who have successfully completed the programme, and wish them to make a mark, as a role model for the industry with quality performance and a positive attitude. We, at TKM, take this opportunity to thank ASDC for all the support extended towards this landmark skill programme of Toyota Kirloskar Motor. It is indeed a delight to see these youths holding an elementary education, being developed to be industry-ready with high skill sets through this training programme, contributing to a progressive growth of our country,” he added.